Need a Shampoo and Conditioner with active natural ingredients to maintain hair in good condition and relieve sensitive, itchy or dry scalp? Many people are looking for a shampoo and conditioner based on natural ingredients that can keep hair healthy, soft, luscious and easy to manage - and leave the scalp feeling fresh, clean and comfortable. We all tend to forget the importance of scalp care until we suffer from an irritation. The scalp is a ‘hidden’ area - it can overheat, may retain moisture in humid weather or when rooms are steamy, and it can suffer in stuffy or smoky environments. Scalp problems can be uncomfortable to live with and can disturb your sleep. Itchiness, flaking or dandruff are usually a hidden secret that’s embarrassing at times. 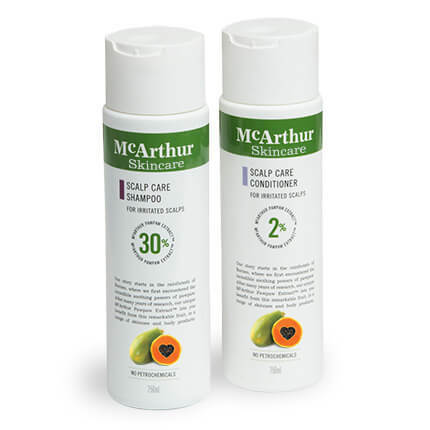 McArthur Skincare's Scalp Care Shampoo and Scalp Care Conditioner have been created to keep hair and scalp healthy, and with regular use provides a good hair and scalp care routine. The importance of maintaining both hair and scalp in good condition cannot be overlooked. 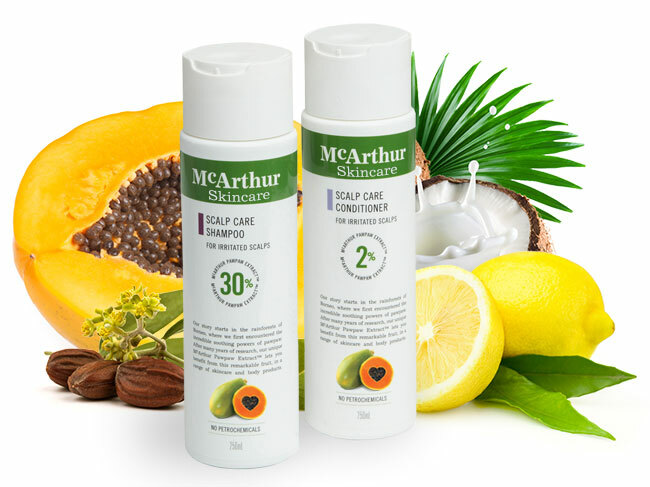 Containing 30% McArthur Pawpaw Extract™, our McArthur Skincare's Scalp Care Shampoo is specially formulated for sensitive, dry, flaky or itchy scalps. Packed full of antioxidants, this soothing shampoo uses the special qualities of Pawpaw (Papaya, Papaw) to gently clean hair and exfoliate the scalp, reducing flakiness and helping maintain beautiful, healthy looking hair. Our McArthur Skincare's Scalp Care Conditioner is formulated for sensitive, dry, flaky or itchy scalps and to nourish and create more manageable hair. It is the perfect partner to McArthur Skincare's Scalp Care Shampoo. No fragrance has been added to McArthur Skincare's Scalp Care Shampoo and Scalp Care Conditioner so these products are suitable for the most delicate skin. Both our Scalp Care Shampoo and Scalp Care Conditioner have been created to harness natural ingredients that can help maintain both your hair and scalp in good condition, so your hair looks and feels nourished, manageable and vibrant. Our hair care products contain higher concentrations of Pawpaw extract than any other products we’ve seen. McArthur Pawpaw Extract™ is manufactured exclusively by us and has been referred to by customers as liquid gold! Main active natural ingredient: Pawpaw (Papaya, Papaw). Between them, McArthur Skincare's Scalp Care Shampoo and Scalp Care Conditioner also include a variety of natural ingredients derived from Coconut, Citrus Fruits and Olive Oil. There’s no need to live with hair problems or an itchy, dry scalp when you can use McArthur Skincare's Scalp Care Shampoo and Scalp Care Conditioner to maintain a healthy routine for your hair and scalp, keeping hair healthy, soft, and easy to manage, leaving the scalp free of flaking and irritation and keeping it clean and comfortable. All products in the McArthur Skincare's Hair Care range use natural ingredients. Always keep your McArthur Skincare's Scalp Care Shampoo and Scalp Care Conditioner stored at a temperature under 30° Celsius. Active natural ingredients have been carefully selected and blended by our McArthur Skincare specialists to create our Scalp Care Duo Pack while avoiding harsh additives. Gently massage into hair and scalp to create a lather. Leave on the hair for 1-2 minutes before rinsing. For best results, follow with McArthur Skincare's Scalp Care Conditioner.